One of the many challenges of the modern world is to help people with mental health problems. That’s what PureCare is here to do. Based in Gillingham in Kent, PureCare has been registered with the Care Quality Commission since 2006 and gained 3 stars (under the old inspection standards) within 18 months of opening. and choices, to enable people to develop confidence, independence and a sense of self-worth. First and foremost, we acknowledge that we work with individuals and work to create a service which takes into account people’s needs and preferences. Mulberry House is a low level support unit where we can assist people who are likely to progress into their own accommodation. Rock House and Arden House are 24 hour supported residential environments where the focus is firmly on rehabilitation through the teaching and reinforcement of life skills. 87% of the 60 crisis incidents we have had in our residential setting over the last 6 years have been managed in-house and hospital admission has been averted. I’ve been with PureCare for almost six years. I have absolutely loved living here. The amount of support I have received has been excellent. Staff are always there for me whether good or bad. I have received help not only with my mental health but physical health, finance, medication and any other problems. All Staff are friendly, understanding and you can have a laugh with them. I would recommend PureCare 100%. No matter what your needs, they can help you. The staff at PureCare were really great during my time there. They always supported me when I needed it. I had and still have a great rapport with staff from both Rock House and Mulberry House and still stay in contact with them even after it being a year since I moved on. I also have many good memories. Purecare played a big part in my recovery and always made time to speak to my care team. I believe that laughter is the best medicine for mental health and laughter is certainly what I received whilst being with PureCare. I am now thinking of starting a career in health and social care as a peer support worker as I want to be able to give back and help people that are in the situation I once was. During my time at PureCare the staff supported me through good times and bad. I was quite ‘lost’ when I first left hospital and the staff helped me work through my difficulties at that time. I moved from Rock House on to Mulberry House after two years and again the staff gave me the appropriate amount of support that I needed at that time. I am now in the community living independently and I’m so happy. I was fully supported through this transition and I feel that my time with PureCare and the support they gave me, right through from leaving hospital to moving into my flat, really paved the way for me to make my journey to independence. Thank you PureCare. PureCare is a family-oriented organisation which is well run. We have a lovely, close team and this is definitely a very rewarding job. I started here as a Support Worker and am now a Senior Manager. PureCare definitely gives opportunities for career progression. I like PureCare. Everyone’s heart is in the right place. We all sing from the same hymn sheet and try to do our utmost for our clients. We treat clients as individuals…as family or friends. We aim to promote independence for our clients and we always go above and beyond what’s expected. We have a family-oriented culture and it’s a fun, friendly and passionate place to work in. 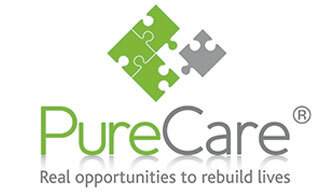 PureCare strives to push people forward, providing opportunities for career progression. This is a service which moves clients on to achieve their aims. In my 18 years of working in the sector, PureCare is the only organisation that actually manages to do this. I am very happy with the service. I moved into Rock House in 2014 and my journey and experience has been very good from PureCare. Over my time staff helped me to gain my confidence through support to local activities and education programmes. Staff also put me in touch with the 147 club which has been life changing. I have also been supported to gain the confidence to self-medicate and improve on my A.D.L skills. I moved over to Mulberry House in 2015, and again the support I have received has led me to grow; now I am ready to live independently and I have acquired my own flat in the community. I would like to thank all the staff at PureCare that have been involved and supported me in my recovery; I wish you all the best.